Found 3 file extension associations related to Sonicfire Pro Express Track and 3 file formats developed specifically for use with Sonicfire Pro Express Track. Express Track is the only royalty free music search engine to combine sophisticated technology that gives you meaningful, comparative search choices with patented, industry leading technology that customizes the length, mix, moods and arrangements to meet the creative needs of each scene. 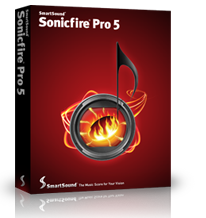 If you need more information please contact the developers of Sonicfire Pro Express Track (SmartSound), or check out their product website.